I recently read an interesting article about the increasing incidence of neck pain due to texting. The article called it “Text Neck” and explained how the further you jut your head out and look down to text, the heavier the load that is placed on your cervical spine (see article: http://www.washingtonpost.com/news/morning-mix/wp/2014/11/20/text-neck-is-becoming-an-epidemic-and-could-wreck-your-spine/). 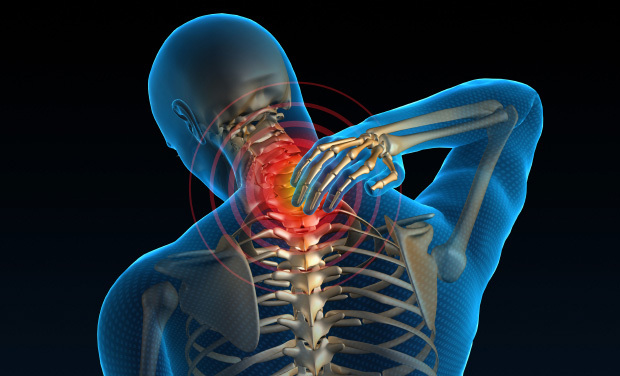 Over time, this can lead to an aching neck and jaw as well as a forward-head posture that rounds the shoulders and puts strain on the upper back. And if you think about it, this posture isn’t only apparent when you use your smartphone. It is continually reinforced when you’re working at a computer, when you’re washing the dishes, wearing a heavy backpack, driving a car, or even when you’re in a yoga class. Is your posture becoming a pain in the neck? I often ask students in my yoga classes to stand tall in “mountain pose” (Tadasana) and “roll your shoulders back once and set them down”. This simple instruction helps to re-align one’s posture, opening up the chest, lifting the chin, and re-setting the position of the head. But if you have “forward-head posture”, this might feel as though there is more strain on the neck. So I add the instruction “draw your chin in slightly and allow it to be parallel to the floor”. This helps to bring the head back into alignment…if only for that moment. One stands taller, opens up a better channel for breath and energy to flow, and creates a stance of self-confidence. The key is to continue to be mindful of this positioning throughout the practice, not just in that one moment while standing in Tadasana. Next time you flow through a Sun Salutation or any other sequence, be aware of the alignment of your head in relation to your spine and see if it’s the head that leads rather than the “heart”. When you lead from your heart centre in a forward fold, it helps to reduce the forward-head posture. With a prolonged forward-head posture (FHP), often the muscles of the upper back are overstretched and weak, and the shoulders are rounded, creating a more exaggerated rounding or “kyphosis” of the upper back. Back-bending yoga poses that encourage strengthening of these muscles are important, such as low cobra (Bhujangasana) which emphasizes extension of the thoracic spine. But it’s important to remember the position of the head, drawing the chin in slightly so as to counter the tendency to bring the head forward i.e. “leading” with the chin. Bow pose (Dhanurasana) and camel pose (Ustrasana) also extend the spine and include bringing the hands behind the body and engaging the upper back muscles, helping to strengthen these weak areas. In addition, back-bending poses can help stretch tight chest muscles that result from a forward rounding of the shoulders. A supported chest-opening pose lying back on a bolster such as reclining bound angle or “butterfly” pose (Supta Baddha Konasana) or supported fish pose on blocks (Matsyasana) can provide this much-needed stretch. The beauty of a well-balanced yoga class is that it moves the spine (including the cervical spine) in all its ranges of motion – flexion, extension, rotation, and side-bending. But if all those movements are done with the head out of alignment and the chin jutting forward, are we creating more imbalances throughout the body? Take the practice of Yin Yoga, where one is encouraged to release passively for an extended time into a seated or lying pose that gently “loads” the joints (including the vertebral joints) in order to bring about a subtle (or sometimes profound) release in the connective tissues and promote better flow of chi or prana. I love this practice…however I’ve been noticing more and more how the forward-head posture is increased in many of these poses. As the head hangs down, for example, in any of the passive forward-bending poses such as “caterpillar” (a passive version of a seated forward bend or Paschimottanasana), I can see how we are creating yet another incidence of prolonged FHP where more strain is being placed on the neck and upper back. I often advise students on how to use props to help support their heads and spines, but we sometimes seem to “go all out” rather than easing off in the moment. In keeping with the yogic principle of non-harming or Ahimsa, how can we be more mindful of our alignment in this practice…in all practices? How can we bring more balance (both yin and yang) into our practices so as to counter the effects of postural imbalances? I believe that the key is just that – being MINDFUL. Paying attention to how we are holding ourselves informs us about where tension is being felt in the body, how it is affecting other areas, and what it is doing to our breathing. It allows us to then make shifts in our position and even in our thinking. Being aware of the importance of aligning ALL parts of the body helps us to focus on the WHOLE person – physically through postural adjustments; energetically through diaphragmatic breathing; mentally through mindfulness of sensations, feelings, and emotions; and even spiritually by treating the body as a sacred vessel that houses Spirit or the soul. Alignment isn’t just about holding yourself UP in perfect anatomical position; it’s about finding that place between effort and surrender, yin and yang, lunar and solar. That place that brings ease of breath, ease of movement, ease of stillness, peace of mind…For each person it will be different, so it’s important to listen to your own body intently. The next time you hear that familiar “plink” sound from your smartphone signalling a text, email, or Facebook post, use this moment to pause and re-align. Roll your shoulders back once and set them down. Lift your head slightly and stand/sit with confidence. Take a full deep breath in and let it go. Then instead of bringing your head to your phone, just nod a little and lift your phone a little higher. Instead of reinforcing TEXT NECK, change your posture patterning to SPINE ALIGN! I wholeheartedly agree, Anne. Thank you for explaining this phenomenon in such careful detail. I found that intentionally practicing upright posture led me to doing it automatically, all the time – it’s habit-forming, the helpful kind of habit!